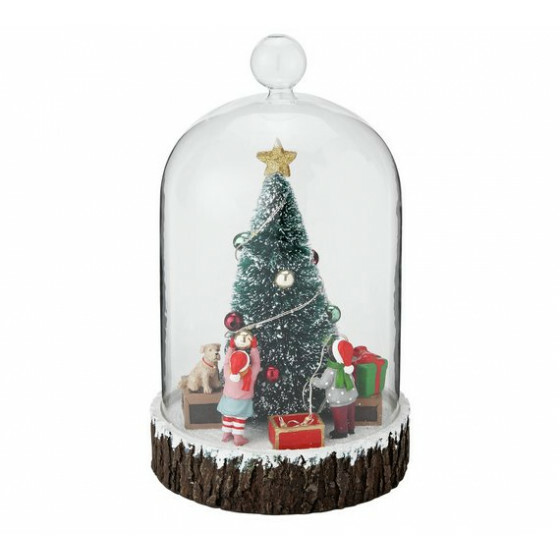 This sweet little cloche invokes memories of Christmases gone by. A traditional Christmas centre piece, this sweet little cloche invokes memories of Christmases gone by. Tiny figures decorate a miniature tree inside the glass dome of the cloche, while boxes of ornaments lay at their feet, overlooked by a little dog with a festive red collar. Perfect for your Christmas table, this unique decoration will certainly strike a nostalgic note among the carrots and potatoes. Size H23, W13. 4, D13. 4cm. Requires 3 x AAA batteries(not included).